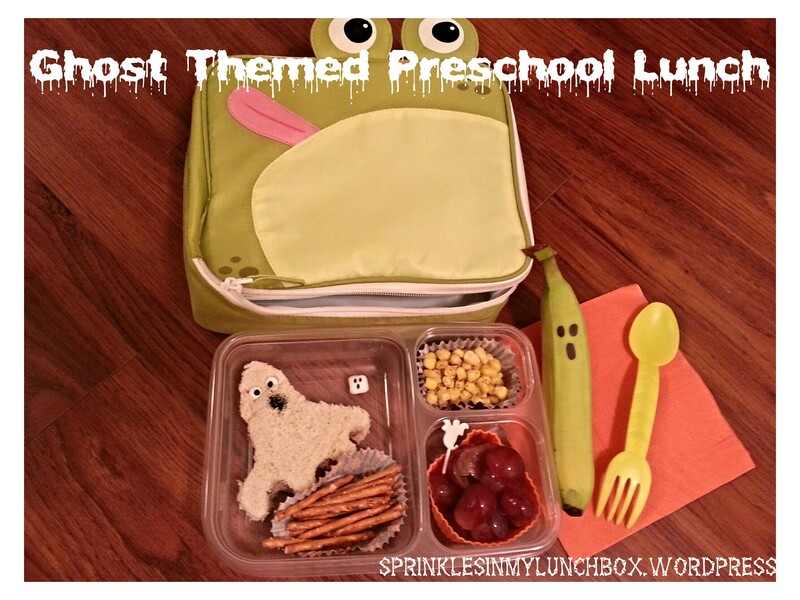 Ghost Themed Lunch: A ghost shaped PB&J, I used candy eyes and Food Writers for the mouth, seasoned corn, grapes, pretzel sticks, a tiny little marshmallow ghost and a ghost banana for snack. 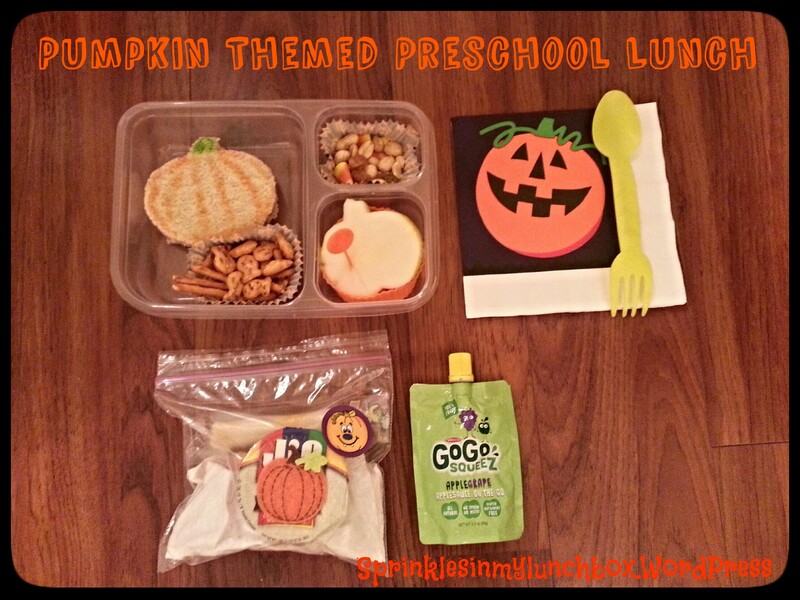 Pumpkin Themed Lunch: A pumpkin shaped PB&J, pretzels, Autumn mix (peanuts, golden raisins, candy corn), pumpkin shaped pear slices, a squeezy fruit and a bag (with pumpkin stickers) of carrots, PB for dipping and a cheese stick for snack. 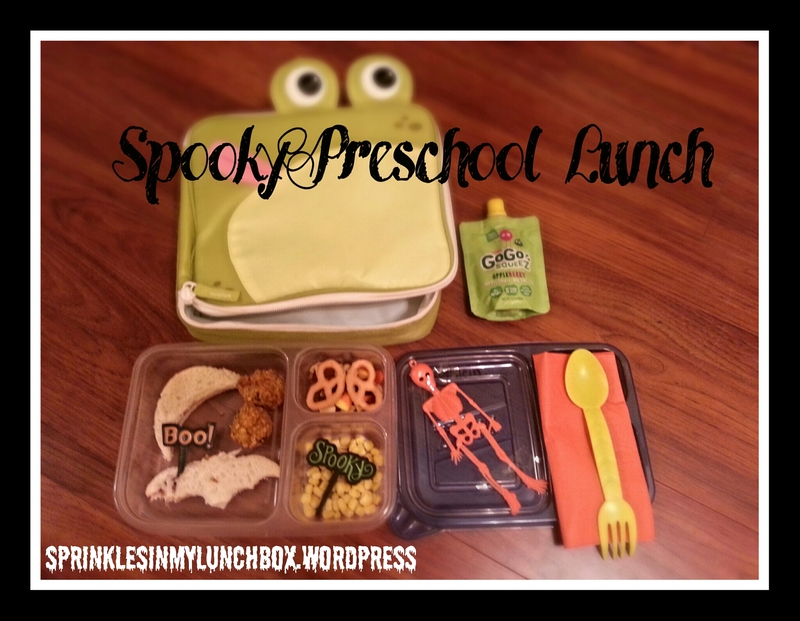 Spooky Themed Lunch: A Bat and moon shaped PB&J, two carrot mini muffins, Autumn mix, two pumpkin yogurt pretzels, corn and a squeezy fruit. 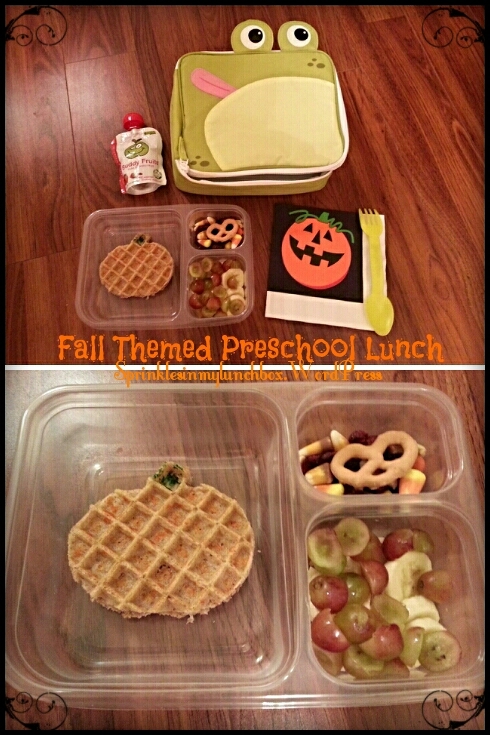 Fall Themed Lunch: A pumpkin shaped PB & pumpkin butter on a pumpkin waffle, grapes and bananas, Autumn mix and one pumpkin yogurt pretzel. 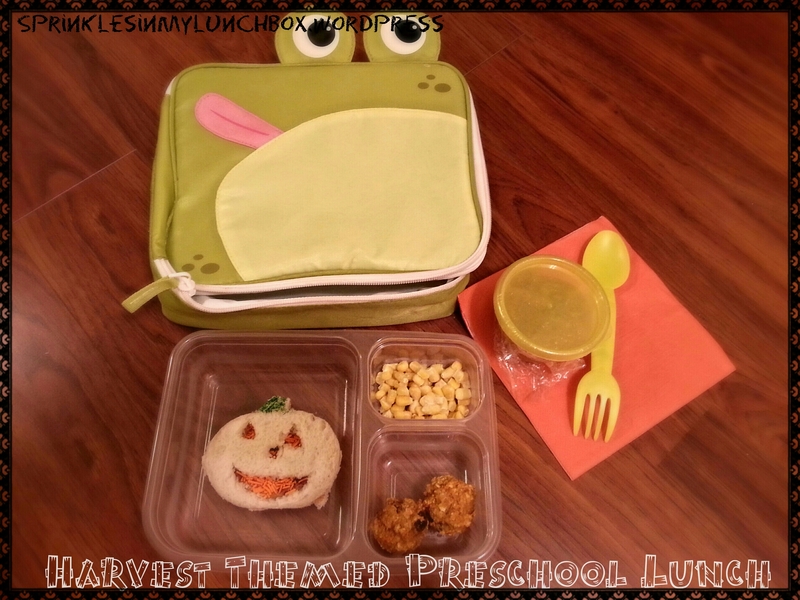 Harvest Themed Lunch: A PB&J jack ‘o’ lantern (cutouts filled with orange sprinkles), corn, homemade applesauce and two carrot mini muffins. 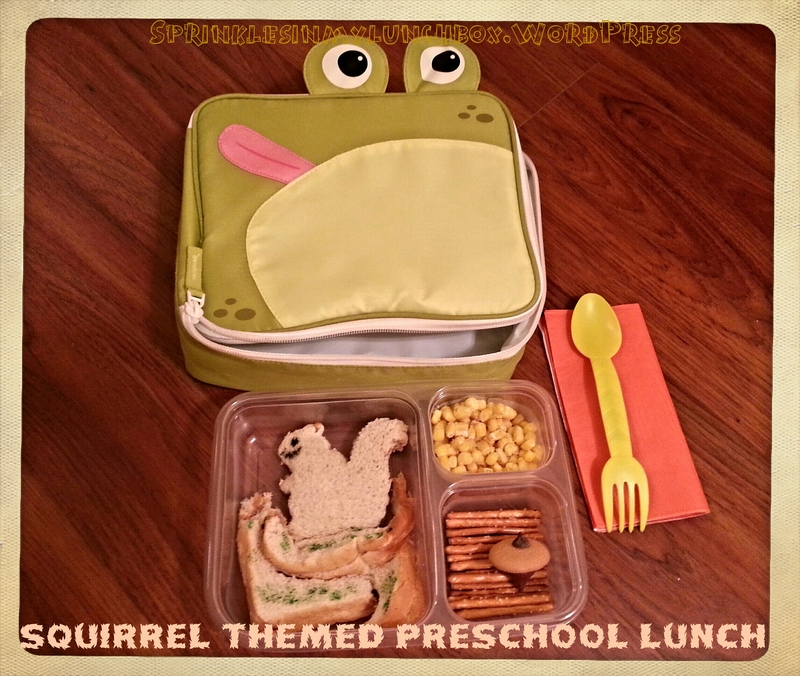 Squirrel Themed Lunch: A squirrel shaped PB&J, crusts parading as tree branches, seasoned corn, pretzel sticks and an acorn for dessert, made using a vanilla wafer, chocolate chip and a Hershey’s kiss. 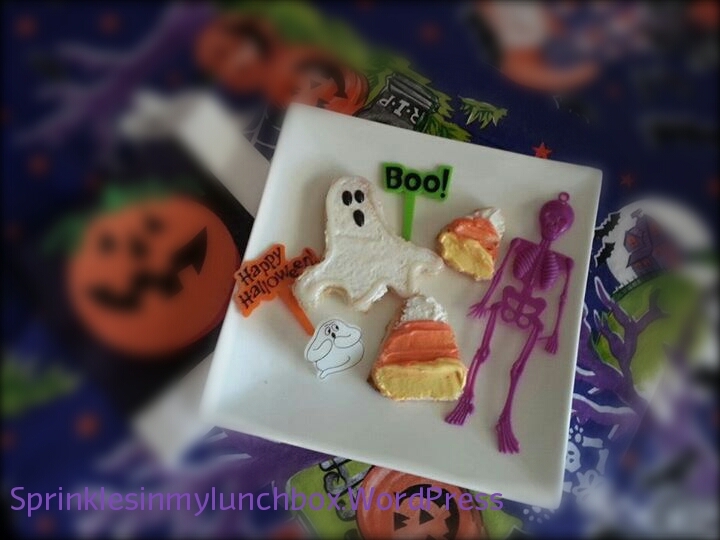 A fun, festive snack made with toast shaped like a ghost and candy corn and spread with tinted cream cheese. Up close! 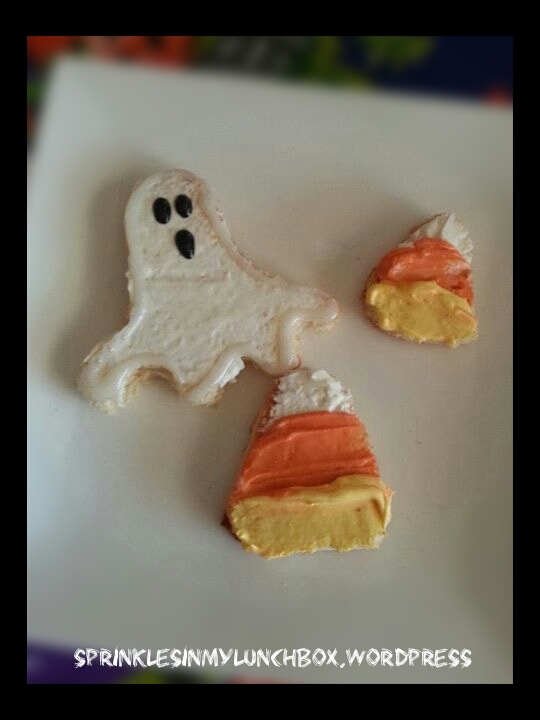 I used decorator’s icing for the details. 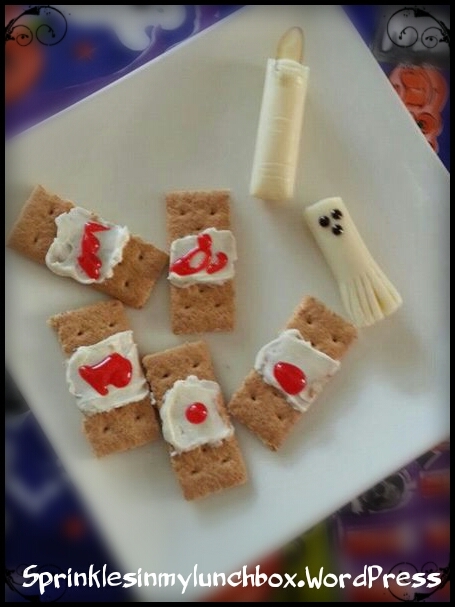 A spooky and disgusting-looking snack that grossed me out even making it: “Bandaids” made with graham crackers, cream cheese and decorator’s icing, a ghost string cheese and a witch’s finger (string cheese, almond slice). 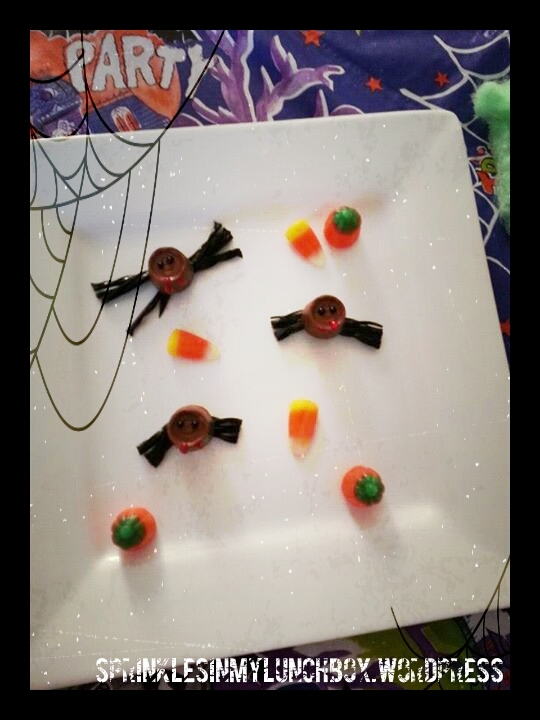 And after dinner dessert for the family: spiders made from Rolos, black licorice and decorator’s icing, Autumn mallow candies. 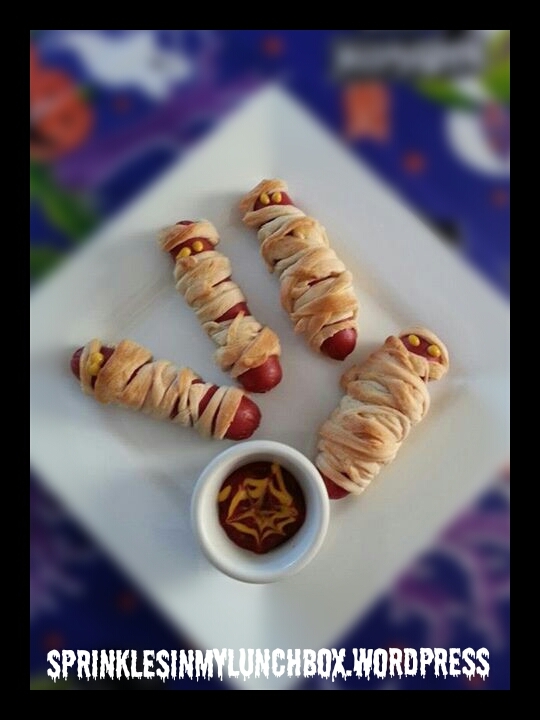 Hot dog mummies! These were a cinch to make and were probably my favorite! All you do is wrap crescent rolls (stretched out) around a cooked hot dog and bake. The spider web sauce is simply ketchup and mustard. 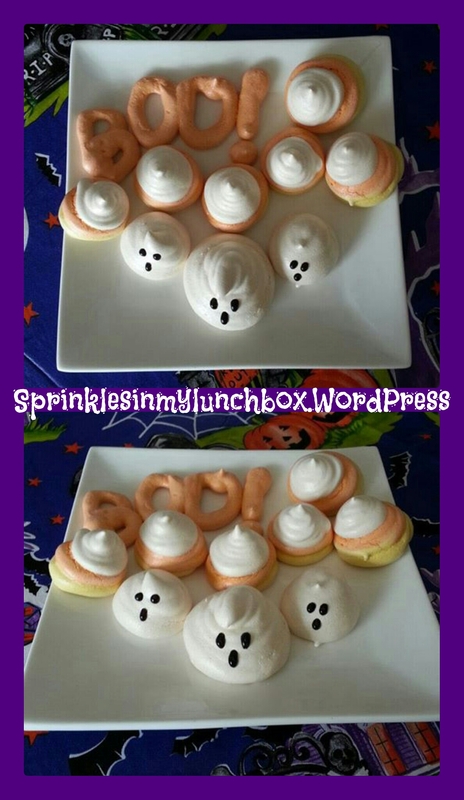 These were a hit! Another after dinner dessert made from a simple meringue that I tinted and layered and decorated. 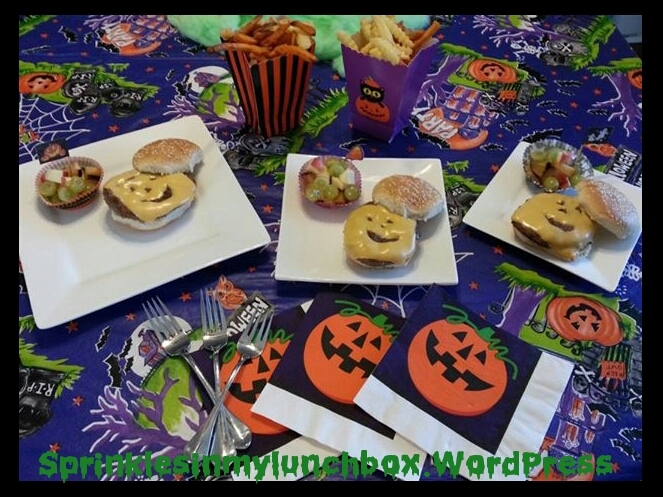 Jack ‘o’ lantern cheeseburgers for dinner! It was very simple to cut the cheese (tee hee) and these were easy to make. This was also a hit! 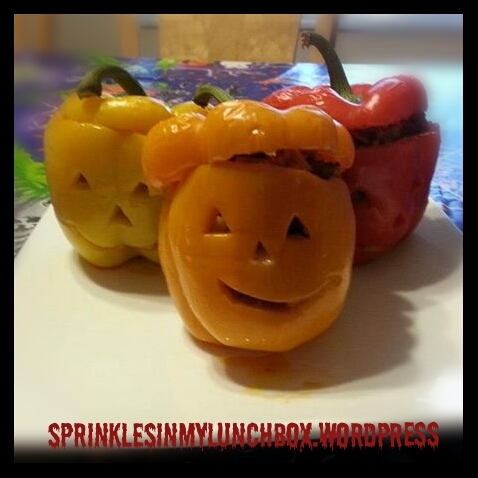 Jack ‘o’ lantern stuffed peppers! Delicious and so cute!